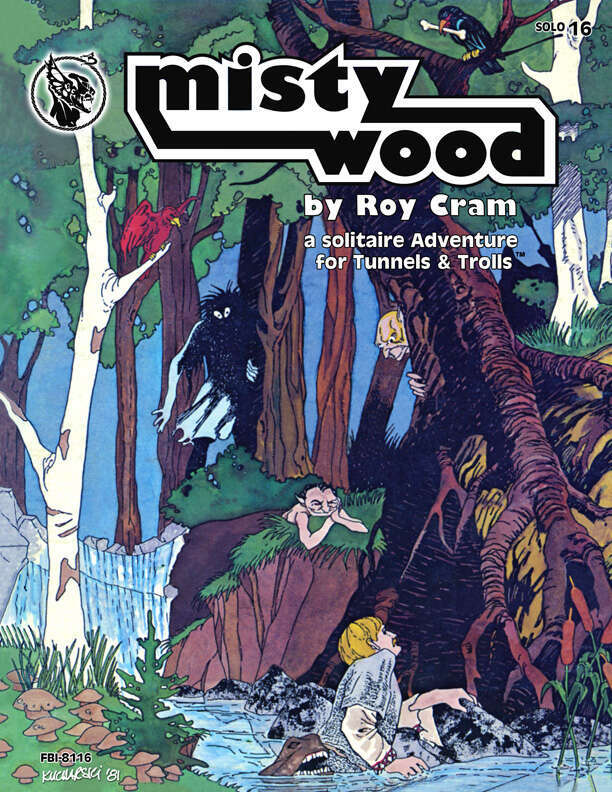 Mistywood...a solitaire adventure for Tunnels & Trolls. You will need the Tunnels & Trolls rules to play. The drunken nobleman in the brothel in Kasar had insulted and attacked you, so you spilled his guts in self defense. But how were you to know that the perfumed young rake was the only son and heir of Grand Duke Karl Bronzo, the Tyrant of Kasar? You were lucky to escape as the furious noble's servitors turned the city upside down in their efforts to capture you. You fled eastward until fatigue compelled you to stop here in Bumley, on the border of the legend-haunted Mistywood. Nothing But weariness would have made you stop here either, in this rundown and ramshackle excuse for a town. At least the inn was still open, but at midnight an awful howling outside wakes you from a nightmare in which a hideous, dog-faced demon pursued you through some black and evil forest whose leafless branches clawed and groped and gashed at you. No one knows what horrors lurk in the heart of the Mistywood - but with the Duke's men hot on your heels, you have no choice but to journey there!